How is your child spending summer break? 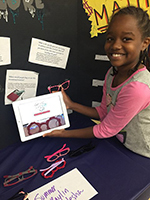 DCPS offers many enriching opportunities for current DCPS students from elementary through high school over the summer months. From enrichment to credit recovery, find it at DCPS! Select a program below to learn more, including locations and registration information. Ignite your passion and discover a joy for reading! Summer Discovery (Grades K-5): Dive deep into a thrilling topic of your choice, such as astronomy, drama, or engineering. You will explore your topic through hands-on activities and engaging field trips. Summer Pathfinders (Grades 6-8): Take an exciting course that allows you to explore your interests, carry out original investigations, and solve real-world problems. DCPS is pleased to continue our partnership with Springboard Collaborative and will be hosting their program for early readers at three sites. This program is intended for K-2 students who are behind grade level in reading but are not at risk of being retained. In addition to targeted reading instruction, the program also includes home visits, family workshops, and incentives for students and families. Eligible families will be contacted by DCPS with instructions to register. IMS-ELLSAP offers rising English Language Learners (ELLs) in grades 4-8 a rigorous, personalized academic program to support students’ English language development. ELLs will be better prepared to succeed with content area learning in the fall as a result of attending. The program also provides enrichment activities to nurture an international community inside and out of school for ELLs. With a focus on pluralism and diversity, students will participate in field trips, community building, and guest speaker activities related to themes in their academic and extracurricular coursework. This year we are pleased to offer an after school component focusing on Chinese language, customs, and culture. This unique opportunity will enable students to earn a .5 foreign language credit in Chinese. Please note interested applicants need to register for both the summer school and extension option on the application. Calling all aspiring mathematicians! This is an opportunity for rising 8th graders who want to be better prepared for Algebra I. Students will engage in lessons, activities, and explorations in order to solidify their foundational math skills. 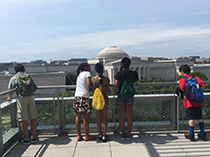 The Language Acquisition Division will be offering a summer school program for English language learners, grades 9-12, to be held at three DCPS high school sites. ELLSAP, in its sixth year, continues to provide a rigorous academic program while supporting the students’ progress in English language development. Students who participate in ELLSAP develop greater English proficiency, advance through courses and grade levels and are supported as they work towards high school graduation. High school students in grades 9-12 will continue with their English language development, engage in credit recovery, and pursue original credits in core content and elective classes if found eligible. The District of Columbia Public Schools (DCPS) is offering secondary summer school across the city to provide all students in grades 6-12 an opportunity to earn a passing mark in courses they failed during the regular school year that meet promotion and graduation standards. This five-week extended learning opportunity will offer students additional rigor and support they need to successfully gain a comprehensive understanding of course content. Breakfast and lunch will be served daily at all summer school sites. In ESY, students receiving special education services will work on the critical skills identified in their IEPs. Instruction, services, and programming will be individualized to meet their specific needs to ensure they will be ready to start the school year in the fall. This program is only open to students who have been found eligible for ESY during their IEP meeting.